A new state of the art Basketball court in Nairobi’s Kibra constituency is set to light up the area with others similar courts set in other locations expected to spur a new image in the sport . This is courtesy of the outreach program by Giants of Africa (GOA) in partnership with the Nairobi County Government. The new court is located at Joseph Kang’ethe Grounds behind Moi Girls High School and is expected to be ready on January 31st. This is the second court being constructed by the organization following the successful installation of a similar facility at Diwopa Catholic Church in Kayole Estate last August. The construction of St.Joseph Kang'ethe basketball court in Nairobi’s Kibra constituency is one example of the pilot projects started by GOA that will improve the game and make Kenya a giant in the game. GOA has appealed to other counties to form county teams in a bid to streamline and spread the game to the grassroots. 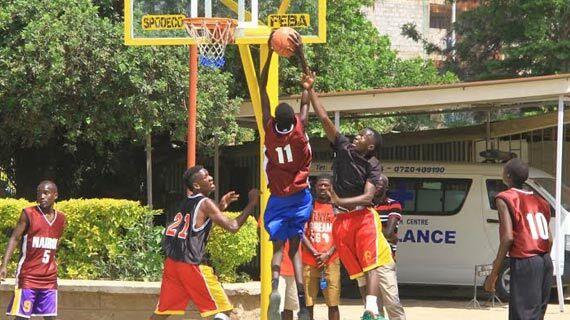 GOA Basketball coordinator for Southern and Eastern Africa Abel Nson who was flanked by International Basketball Federation of Africa (FIBA) commissioner Wesonga Agina said it was unfortunate minnows like Burundi and Uganda have overshadowed Kenya standards which is unacceptable. “Our primary objective is to empower the youth with facilities to develop both physically and socially via sports. GOA helps with the infrastructure and the county government avails the land and facilitates the tournament,” said Nson. “The county government is financially supporting the tournament logistics and facilitation of the tournament and also availed the land the court is being built on,” said Mr. Nson. “GOA also facilitated a clinic for all the team coaches to ensure that they have the latest basketball knowledge which they will later impart to their players,” he added. The tournament is also being used to select Nairobi’s top twenty Under-18 boys who will proceed to a training camp later this year. additional court and spreading the game in major Nairobi constituencies..
“Kenya as a country has witnessed the decay and loss of grassroots sporting facilities which in turn has affected the growth of local sports in general. I’m glad that the county government is working with GOA to ensure that these facilities are restored and our youth get a chance to showcase their talents,” said Mr. Wesonga. Ms. Tausi Mohammed Chief Sports Officers Nairobi County believes that this initiative will help other areas in Nairobi to commence youth programs of their own. “It’s our responsibility to ensure that the county youth are involve in activities that will help them develop positive attributes that will guide their lives and benefit their respective communities,” said Ms. Mohammed.